Results: November 2016 Philippine Bar Exam (List of Passers and Topnotchers) - Balita Boss! The Supreme Court (SC) released the official results of 2016 Philippine Bar Exam on Wednesday, May 3, 2017. The examination was conducted by the SC last November 6, 13, 20, and 27 at the University of Santo Tomas in Manila. A total of 3,747 out of 6,344 examinees passed the 2016 Philippine Bar Exam, according to SC. KAREN MAE L. CALAM, a graduate of University of San Carlos, ranked first in the 2016 Philippine Bar Exam with a rating of 89.05 percent. ABBU, JR., Jose Pepe S.
ABEJERO, Marian Jo Silma E.
ABELO, Shyrell Morena Marie C.
ABERIN, Ma. Bernice Doreen M.
ACAS, II, Jose Realito A.
ADRIANO, Angeli Rose Therese R.
ADVINCULA, Bai Hundra Cassandra Dominique N.
AGBAYANI, JR., John Glenn C.
AGDON, Ma. Regine Joyce C.
AGUILAR, II, Sir Frederick C.
AGUINALDO, Ma. Janelli Erika K.
ALIDO, Kristell Ann Marie O.
ALLENA, Fundador Domingo Antonio L.
ALTERADO, Annie Lyn Kaye B.
AMBAS, Charlotte Francis Marie O.
ANDAL, Kristina Marie Joy B.
ARCONES, Therese Lorraine Grace S.
ATANACIO, Zinnia Farica May V.
ATIENZA, Edwin Giann Paul B.
ATUTUBO, III, Aedler Jo-lean A.
AVILA, JR., Charles Richard C.
BAGASALA, Ma. Jamine De La Paz C.
BALAJADIA, Nasreen Love Joy DG. BALINDONG, Mohammad Bin Ali B.
BALIWAG, Ian Mark Gari T.
BANICO, Jose Mari Gerardo R.
BARRIOS-DE LEON, Noelle Ann E.
BATOCABE, Justin Caesar Anthony D.
BELENO, Iriz Kay Deziree B.
BENOSA, Maria Emilynda Jeddahlyn Pia V.
BERNAL, Rv June Zoe B.
BITUIN, Remy Rose Ann S.
BOADO, JR., Julius Caesar V.
BOMBASE, Ma. Clarissa Lavena A.
BONGHANOY, Rei La Datsun G.
BUMANGLAG, Candida Dorothy Swerte D.
BUNYI-DE LEON, Judith Marie G.
CABE, III, Adam Anthony S.
CAGULA, Jane Carressa Mae T.
CALAYAN, Clara Maria Beatriz S.
CARAG, Dane Caceus Marionne M.
CASILA, Ma. Erika Amor D.
CASTELO, II, Enrico Edmundo D.
CASTILLO, Jeanne Marie Vernice V.
CASTRICIONES, Juan Lorenzo Maria S.
CASTRICIONES, Miguel Ignacio Maria S.
CASTRO, James Marvin Earl E.
CAYETANO, Baby Marian Grace A.
CHAN-GONZAGA, Ismael Jose, Iii V.
CHUA, Jessamine Lynn Dale N.
CORTES, Nikkolo Marco Aurelio V.
COSEP, Lech Jb June S.
CRISTOBAL, Mely Ann Emerie A.
CRUZ, Anne Margarette Justine M.
CUA, Pia Maria Barbara Mirca C.
DANGILAN, Sean Michael Joseph C.
DAYOG, John Edward Lee F.
DE ALBAN, Rachel Hazel T.
DE CASTRO, Michael Christopher C.
DE GALA, Maria Connie R.
DE GUIA, Molee Uzworth B. DE GULAN, Jeff Marvick R.
DE GUZMAN, Bien Ronald L.
DE GUZMAN, Carl Louie R.
DE GUZMAN, Chanell Dolor D.
DE GUZMAN, Isabelle Vien S.
DE GUZMAN, Joyce Dianne J. DE GUZMAN, Ma. Celine Angela K.
DE GUZMAN, Willie, Jr. P.
DE GUZMAN, JR., Geronimo T.
DE JESUS, Paula Bianca F.
DE LA CERNA, Erika-anne Therese D.
DE LA CRUZ, Alexandria F.
DE LA CRUZ, Shugen P.
DE LA PAZ, Marveen B. DE LA ROSA, Jomel Noi A. DE LA ROSA, Vican Jess D.
DE LARA, Sarah Mae M.
DE LEMOS, Mirriam Andrea V.
DE LEON, Anna Teris M.
DE LEON, Leonore Angeli B. DE LEON, Rod Rafael M.
DE LIMA, Darcy Bertulfo E.
DE LIMA, III, Gregorio L.
DE LOS REYES, Girlie May M.
DE LOS SANTOS, Naiza Mae N.
DE LUNA, Amie Roxylen T.
DE TORRES, Alenz Avril P.
DE VERA, Jeseth Marie Loren P.
DE VERA, Ma. Cristina A. DE VEYRA, Christopher Edward M.
DE VEYRA, Kenneth Spice M.
DE VILLA, Sheena Mara R.
DEALINO, Jose Aniceto David S.
DEL CASTILLO, Jan Emmanuel F.
DEL MUNDO, Ronald Rae C.
DEL ROSARIO, Lily Rose L.
DEL ROSARIO, Ma. Jescelyn O.
DEL ROSARIO, Ralph Gabrielle D.
DELA CRUZ, Aardan Mikhail Kutch C.
DELA CRUZ, Erlene Luz V.
DELA CRUZ, Gretchen Mari M.
DELA CRUZ, Hacel Grace T.
DELA CRUZ, Jamaica Kay S.
DELA CRUZ, Jennah Marie C.
DELA CRUZ, Jolet Paulo D.
DELA CRUZ, Pearl Sharon A.
DELA FUENTE, Rafael Kenneth M.
DELOS SANTOS, Alexandra Patricia L.
DELOS SANTOS-DY, Gretel Kelly M.
DESTURA, Salvador Julius Caesar B.
DIAZ DE RIVERA, Jon Vincent B.
DIEGO, III, Fidel Maximo M.
DOLDUCO-CONSTANTINO, Ma. Cassie Jean D.
DOLLENTAS, JR., Oro Rabi T.
DOMINGO, April Joy Benezia B.
DY KAM, Ruth Francis A.
ELAMPARO, Trixie Marie Naldine M.
ESCOBAR, II, Hilary Romeo A.
ESTACIO, Israel Earl Laurente C.
FALGUI, Maria Mikaela Luz V.
FERNANDEZ, Alipio Vittorio Ramon D.
FERNANDEZ, Maria Divina Gracia B.
GANA, Dominique Marie Akio Therese P.
GARCIA, Sidhartha Felice Mae O.
GEMPIS, Kay Kari Ann J.
GENOLOS-MONTEMAYOR, Kyrie Dea Maia T.
GEPUELA, Jose Margarito Gerardo C.
GO, Carlo Miguel Romeo S.
GONZALES, Maria Ivy Kristel M.
GONZALES, Rose Ann Joy V.
GONZALES, IV, Ernanie Erwin L.
GONZALES-PILAR, Maria Nadia Nalinac V.
GOTEESAN, Reeve Marlo Arturo S.
GUIDOTE, JR., Jose Angel B.
GUMABOL, Vanessa Trina Carr B.
HICETA, Esteele Vanessa Ann A.
ILARDE, Maria Pilar Joy C.
IMPERIO, Marc Aerone Paul DP. INTING, Niña Ma. Socorro B.
KALAW, Ma. Rosa Vinia A.
KEITH, Charles Simon Victor E.
KHIO, Alanna Gayle Ashley B.
LABASTIDA, Daisy Mae Luinor A.
LABRADO, JR., Jay Ronald Emil John D.
LACSON, Maria Florencia Alicia S.
LAGMAY, Martin Alfredo Benjamin T.
LAMARCA, Pola Lia Celina L.
LAMORENA, Ma. Alyssa Jeline A.
LANTING, Jualie Labette Marie M.
LAPPAY, May Rose Abigail A.
LEONIDA, Kerwin Gerard Reynato U.
LEONIDAS, Maria Karisa Joy C.
LI, Gilyen Ezra Marie L.
LIBUTAN-DUEÑAS, Cyd Kristine Daphne S.
LOZANO, Kevin Jardine Lucky S.
LUD-AYEN, Ma. Desiree Zan L.
LUSPIAN, Lloyd Matt Garette B.
MACAYRA, Maria Lady Hope J.
MACEDA, Mary Joan Dorothy Joy B.
MAGTIBAY, Sahlyna Mia Edly A.
MANAPSAL, Ma. Lourdes Angelynne D.
MANSUJETO, Tosca Leira Ella G.
MARASIGAN, Mary Remie Jane T.
MARTIL, Yussif Don Justin F.
MARTINEZ, Anna Queen Gloria A.
MARUHOM, Ebno Abdul Majid C.
MENDOZA, Maria Monica Pamela I.
MENDOZA, JR., Edgar Carlos G.
MENTINO, Ruwila Anne Marie M.
MINA, Lydia Marie Zyrah MZ. MODINA, Kara Jo Aiza R.
MONTECLAR, JR., Ezem Manuelito G.
MORALES, Viktor Ivan Nicolo T.
MURILLO, Maria Fe Gloria B.
MUSA, Bai Alefha Hannah M.
MUSNI, YR., Beverly Ann S.
NEM SINGH, Kyle Jorrel A.
NG SY, Ma. Katrina Cassandra F.
NIFRAS, Ma. Cristina Filomena G.
NOEL, III, Federico Felipe G.
NUÑEZ, Michael Trance Joseph M.
ONG LOPEZ, Jobelle Lynn C.
OTAZA, JR., Potenciano Bob Q.
PADERNAL, Herman Jae Ii C.
PALATINO, Kerwin Arnold Mawie C.
PANTOJA-DELA FUENTE, Maria Donna P.
PANUNCIO, JR., Yulo Vincent B.
PE, II, Albet Salvador R.
PERIAS, Christine Joy Marie A.
PERRAL, Mark Dale Diamond P.
PEÑA, Ma. Carmela Francia T.
PLAZA, Karen Mae Victoria L.
PONCE DE LEON, Mary Catherine P.
PORNILLOS, Ansis Reyhan Victor V.
QUIBUYEN, Kristelle Joy Ann B.
QUILAB, Miguel Ruperto Rico D.
RAMOS, Maria Perpetua Danisa D.
RAVELO, Ma. Elena Teresa E.
RAYOS DEL SOL, Bettina Jean E.
REALEZA, Ma. Frances Joanna E.
REYES, Carrie-anne Shaleen Carlyle S.
REYES, Kris Mary Francesca R.
RODRIGUEZ, Reynold Anthony Marc S.
RORALDO, Anne Katrina Marie C.
ROSARIO, David Robert Jacinto, Iii K.
SABAS, Mary Raquel Bernadine D.
SADURAL, Jean Aubree Ruby T.
SALISE, Hector Christopher Jr. M.
SAMONTE, David Lawrenz Oliver J.
SAN ANDRES, Robert Ian P.
SAN DIEGO-HERIA, Purita Monica Ann A.
SAN JOSE, Rica Pauline B.
SAN PEDRO, Lei Azenith R.
SAN PEDRO-LADIGNON, Ma. Crisadel P.
SAN PEDRO-TABIOS, Ruth Kristine A.
SAULOG, Juan Carlo Raphael P.
SELMA, Zachary Walter Mari Z.
SINGSON, Ma. Nina Kleighna G.
SINGSON-DELA CRUZ, Noelle Joanna M.
SONGCUYA, II, Emmanuel Eumir F.
SORIANO, JR., Cesar Nickolai F.
SORO, Von Kaiser, Jr. M.
SOUZA, Maria Franchesca Yvette Y.
STA. ANA-MOLAER, Cheryl Lynn S.
STA. MARIA, Iris Jiana A.
SUCGANG, IV, Reynaldo Ross D.
SUMALABE, Marilaine Agnes Pinky A.
TALAG, Ava Beatrice Jackqueline C.
TALINGDAN, II, Juan Karlo G.
TAMSI, Ruby Mary Gold A.
TAN, Christine Anne Marie L.
TAN DE GUZMAN, Jechel L.
TAN-DELOS SANTOS, Joy Lucille C.
TAPE, Darryl June Luigi P.
TIBAY, Ma. Jessica Louise D.
TIBAYAN, Ralbert John Neil P.
TIU SERRA, Gisela Tea B.
UGAY, Maria Lourdes Belyn D.
UY, Eugene Evan Geoffrey E.
UY, Marie Anne Cyra H.
VALDEZ, Katrina April Mennen A.
VALENTIN, Aprille Mae Kaye R.
VARELA, Ma. Hortense Elaiza P.
VASQUEZ, Paula Anne Marie D.
VELASCO, JR., James Voldemar R.
VERACRUZ, Leia Clarissa Veronica R.
VERGARA, III, Jaime Oscar Napoleon T.
VICEDO, Maria Vita Esper M.
VIDA, John Michael Gabriel N.
VILLANUEVA, Ma. Clarissa Excelsis S.
VILLAR, Adelfa Febb Candelaria M.
VILLARUBIA, Marc Deus Christian P.
VILLO, Viktoria Mary Antonette P.
YANEZA, Jeane Benalda Ruth M.
YUMANG-PALMA, Ma. Jel Kristine P.
During the last bar examination conducted last November 2015, 26.21% or a total of 1,731 out of 6,665 examinees passed the Philippine Bar Exam, SC announced. The Oathtaking Ceremonies of the successful 2016 Bar Candidates will be held on May 22, 2017 at 3:00 PM at the Mall of Asia Arena. #BAR2016 Results will be deliberated upon tomorrow, May 3, Wednesday. Results released only after SC approves the Chair’s recommendation. 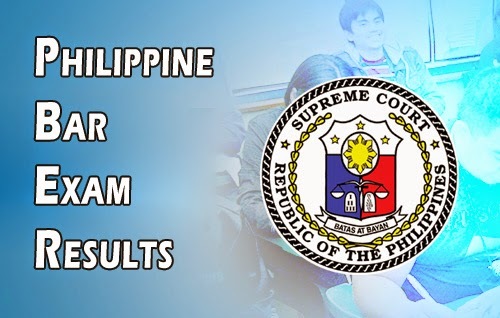 April 26 - The official Twitter account of the Philippine Supreme Court's Public Information Office announced that SC would meet on May 3 to deliberate the 2016 Philippine Bar Exam Results. The SC will hold a special en Banc session to deliberate on #BAR2016 results on May 3, 2017. Results will be released thereafter. April 4 - Contrary to earlier reports, Inquirer.net reported that the target release date of 2016 Philippine Bar Exam results is on Tuesday, May 2 or after the special en banc session. March 27 - As reported by Radio station DWIZ on Saturday, March 25, Associate Justice Presbitero Velasco Jr. said that the results of 2016 Philippine Bar Exam will be released before the Holy Week. Velasco added that the passing percentage is expected to be 40%. Thank you for reading. Please follow Balita Boss on Facebook, on Twitter or on Google+ to receive updated information about the Philippine Bar Exam.